It is not surprising that this work is relatively unknown, except by more enthusiastic sceptics. However, it does deserve to be better known and this is my own small attempt to help redress the balance. It is the most convincing presentation on the inadequacies of General Circulation Models (GCMs) that I have seen and strikes a number of chords for a lapsed physicist like myself. It is not surprising that the general public would not understand the difference between model precision and uncertainty. However, there is no excuse for well funded climate scientists to fail to grasp this basic modelling issue. 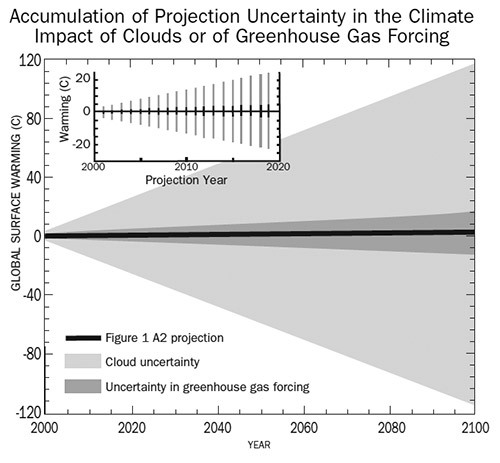 The most significant take out from Patrick’s research, privately funded by himself (and hence my tagging with Inspiring as well as Climate Change) is the impact of uncertainty due to systematic errors in modelling clouds being 140 times larger than the greenhouse forcing being modelled. This leads to the graph below which demonstrates that predicted uncertainty accumulates very quickly so that the predicted temperatures (the darker region in the following diagram) are swamped by that uncertainty. What this diagram does NOT show is that the temperature ranges predicted could be much worse than currently assumed! It simply and powerfully demonstrates that climate modelling is flawed. It also shows that public faith in climate models is fundamentally misplaced because policy makers have no idea at all that this level of uncertainty arises from the models. A secondary take out from his analysis is that his own simplified Model of Models simulates to a close approximation the results of all the existing publicly funded climate models at a tiny fraction of the cost. At the very least it would be better to throw every one of those expensive models away along with their supercomputer infrastructure and save tax payers a huge expense moving forwards. The results would still be meaningless but at least we could afford to fund some real research with the money saved.